Initially, I wanted to get a copy of Palm Island before my family and I went on vacation to Disney World last summer. Alas, I never bit the bullet and instead brought along One Deck Dungeon, which, to nobody’s surprise, I didn’t even play once…for various reasons. Mostly because there are a lot of components to that game, such as a handful of colored dice, and you need a decent amount of table space to really set everything up. The idea behind Palm Island eliminates the need for this space, allowing you to play an entire match in the very palm of your hand. I ordered a copy several weeks ago and am glad to finally have it in my collection, as it actually does what it claims to do. Go figure. Palm Island uses a deck-transforming mechanic that allows a player to play with just 17 cards over eight rounds to shape their island and overcome its unique challenges. You’ll store resource cards to pay for upgrades and upgrade buildings to access new abilities and gain victory points. Each decision you make will drastically change your village from round to round. After eight rounds, you calculate your score, and I’m still ending most of my games in the “needs work” range, but I can see the potential each time to do better. Palm Island is a solo card game with multiplayer variants, and the copy I got comes with enough cards for two decks, which is generous and kind of neat to see. Here’s how the game ultimately works. Each card, which are double-sided, has four states, and they all start at state one when you begin playing. As you proceed through the game, which consists of a total of eight rounds, you may upgrade cards by rotating or flipping them, so long as you have the resources to do so. These actions change the card for the rest of the game and can help you gain more resources or victory points down the line. The decisions then come down to either upgrading your resource cards for more effects or spending all you got to build that grand temple for a ton of victory points. A lot of this deciding is affected by your initial shuffle of cards; for instance, one game, I ended up having all my temples back to back in a row, unable to do anything but skip past them, which meant losing out on a lot of victory points. Palm Island has a fairly distinct look, with artwork done by Jon Mietling. It’s tropical, colorful, and well designed, with clear pictures for different resources and actions. In fact, for cards doing quadruple duty, there’s quite a lot of information to grok, but it never felt overwhelming. I did have to constantly double-check which was the flip upside-down icon versus the flip card over icon, but I eventually got it. The cards themselves are sturdy and thick, but a bit slippery, which can be dangerous when you are playing everything in your hand and trying to keep organized. Turning and un-turning resource cards can be tricky, and if you drop the deck you might as well just start the game over as it can be impossible to remember what order every card should be in. Still, that’s a minor complaint overall. Right. I’ve played it at my kitchen table shortly before dinner. I’ve played it while in the chair at the oncology center getting my latest chemotherapy treatment. I played it on the morning of my wedding to kill time. Palm Island is without a doubt a game I’ll be bringing with me almost everywhere because…well, you can literally play it anywhere. So long as you don’t accidentally drop the deck of cards, you can game it up whenever you want. I truly love that. After a handful of attempts, I’ve still not beaten any final boss in One Deck Dungeon, though I got somewhat close against the dragon, better than my time with the yeti, and I’m perfectly okay with that. Each run is completely different and randomized, and luck definitely plays a major factor into how things go, especially when you consider this is a game of mostly dice rolls, and I’m sure I’ll see a flawless run eventually. Until then, I’ll keep kicking open doors, dodging traps and slaying monsters with as much skill as my character sheet allows, trying hard to save all my health potion cubes for the final encounter. As you’ll recall from my last board game-related post on Friday, I’m getting into solo tabletop gaming. Eventually, I’ll have a post about Fallout: The Board Game, but this is not that post. This one is about One Deck Dungeon, an aptly named roguelike card game, wherein you dive deep into a dungeon for treasures and special skills and build your character up along the way. 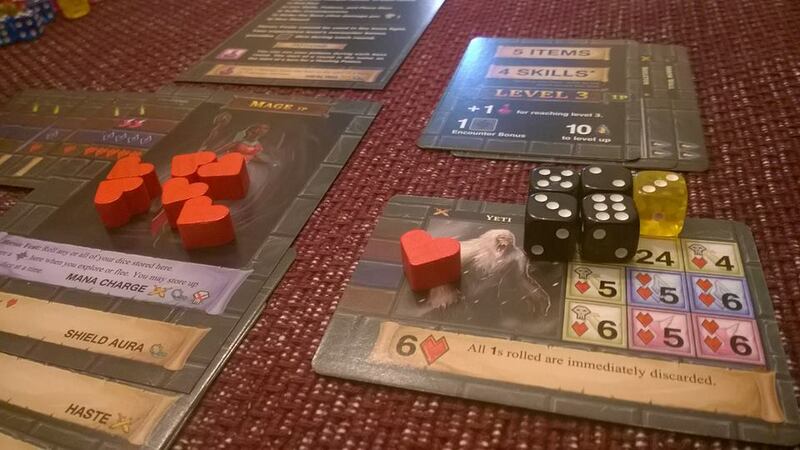 It’s at times similar to Dungeon Roll and far from it, offering a lot more adventure-affecting decisions each turn. The deck consists of your standard D&D-esque enemies to fight, such as a glooping ooze and a skeleton knight, as well as perils like a spiked pit and boulders, and the character classes don’t stray too far from the traditional, featuring warriors, clerics, and rogues. Each door card, when flipped over, represents an obstacle to overcome, as well as the potential rewards for doing so. Each turn, after burning a few cards from the dungeon deck to the discard pile, which represents “time” spent, you can reveal what’s behind a locked door and take it on if your heart desires. If you defeat the card, meaning you are still alive and in one piece after all the effects are suffered, you can claim it as one of several things: experience points, an item, a skill, or a new potion type. Each of these affects your character in a specific way, and your current level card determines how many of each you can use at once. For instance, when playing solo and at level 1, you can have one item and two skills. You then tuck the card under the appropriate side of your character card to show off its benefits, such as an extra die to roll or new skill to use in battle. Identifying a new potion not only nets you more options, but also a free potion cube to boot. Things I’m really liking a whole bunch about One Deck Dungeon are as follows. For one, all the character portraits are women and not sexualized, which is really nice to see in this field where bikini chainmail and mega-muscular dudes run rampant. Layering cards beneath the character sheet and watching the stats and abilities list grow is surprisingly effective and pleasing, reminding me a bit of how Gloom cards went on top of each other, as well as Munchkin weapons and armor sets. Lastly, the manipulation of dice–while at times it can feel somewhat like cheating–is where the most fun shows up, especially as you get more options for re-rolling numbers or exchanging them for other colored dice. Starting off an encounter with a terrible roll and a bunch of ones and walking away from it untouched after covering up every square is an extremely good feeling. Sometimes there can be a lot of elements to be aware of, and the fights can become overwhelming. For instance, you have to remember that spots on encounter cards with a green shield must be covered first before any others, and the dungeon card has its own spots and effects to be aware of, like discarding all ones rolled each fight or spending extra time to use skills. You must also keep track of the enemy or encounter’s special text, as well as your own skills, and I started using extra white potion cubes as markers for when I used a skill so I wouldn’t accidentally use it twice and therefore cheat my way to victory. Occasionally, I’d goof hard and really want to walk back my actions, but it was almost impossible to remember what dice got traded in and what was originally rolled. Also, as mentioned at the top, the boss fights are pretty tough, and I don’t yet know if I’m the problem–remember, I still haven’t gotten past the pirates in Friday–or if they have been designed to be ultra punishing. There’s a standalone expansion to One Deck Dungeon out already called Forest of Shadows that adds poison and dice exiling, but I think I’m good with my handful of scenarios and classes for a bit, unless I suddenly become a dice-rolling god, smiting foes and perils with little effort. I’ve also downloaded some extra content from the developer’s website, printing out the Phoenix’s Den and Caliana class cards myself. Evidently, there’s also a Steam version in the works, if that’s your thing; my experience with board games turned into videogames is somewhat limited, having played only a few matches of things like Smash Up, Catan, and Monopoly Plus, though one day I’d really like to check out the digital entertainment version of Lords of Waterdeep. We’ll see. For now, I’ll keep trying to roll six after six after six.